Known for her wonderful sense of color, keen eye & evocative imagery, Vancouver's Heather Ross, photographer, stylist, artist and now author, is just in the midst of finishing her new book, The Natural Eclectic, a design aesthetic inspired by nature. The book offers a glimpse into Heather's inspiring world through her stunning images and philosophical musings on beauty, nature and design. 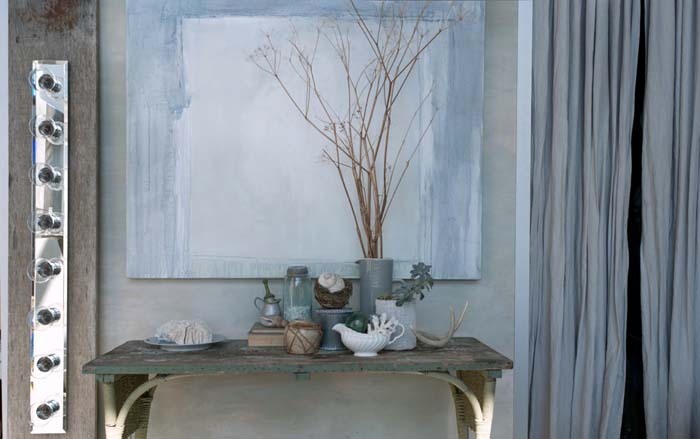 Her west side shop here in Vancouver is set in a beautiful coast-inspired palette (think blue/green, greys, sand/linens and white) and filled with beautifully curated (new and found) treasures like vintage linen textiles to her very own gorgeous original acrylic paintings. Her retail shop alone was excuse enough to pull us into her newest project (the book) and add on top of that her innate talent of creating stunning vignettes, layered with her beautiful photography, and sharing the knowledge that goes into that, we can't wait to see/read the book! Just recently I attended her book cover reveal and asked if she could share her thoughts on how the book cover came about and if we could get a little sneak peek of what we'll see inside when it launches Spring 2016. Here's a little bit of what she had to say. The cover of your book is beautiful. How did you decide on the cover? Thank you. As I expressed at my cover reveal event, like so much of what I do, the actual cover photograph just unfolded very organically. I went away to a coastal property and packed a ton of little treasures in tow for a 10 day getaway to write and do photography for the book. You can imagine it's difficult to plan or decide what you'd want to have on the cover! It has to be timely yet timeless, personal yet impactful to others. Alluring, unique, compelling. With the word eclectic in my title clearly I'm someone who has a variety of loves and interests, so how would I convey and express that all in one image? I started putting together a still life on a panel that I use as a backdrop for when paintings smaller canvasses. It has lovely layers of colors on it from all my different paintings. I started with an old majolica plate I brought back from Paris and composed succulents and moss into the center. I added the branch with the birds nest and then I realized I had a robins egg that I had found in the grass completely intact I could place within it. I just love collecting old Japanese fish float so I had to bring one of those in and that's when I realized I also had this fabulous old barnacled bottle that I could put the branch in like a flower in a vase. All of a sudden as it was coming together I thought hmmm, this could end up as the cover! Over the next few months I must've taken almost 1000 photos that I thought might have been my cover but I always came back to this as my favorite. 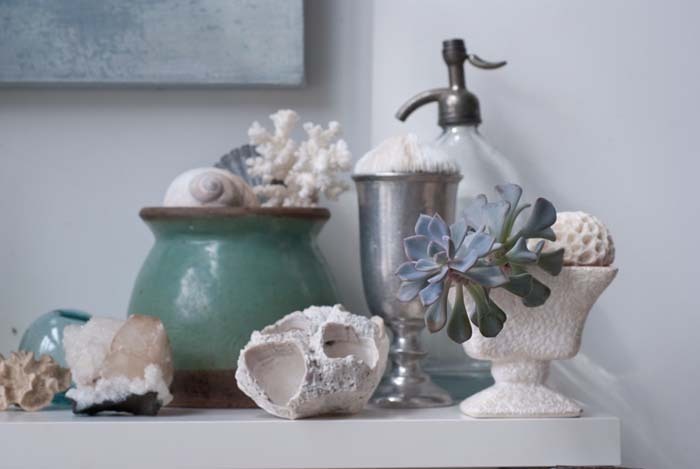 To have all the blue-y green and linen colors that I love so much all brought together in this one dreamy image with my favorite Echeveria succulent, a delicate little sea urchin, and a clamshell as well, brought me so much joy. I hope it does other's too! My book is on a design aesthetic inspired by nature. In it I speak about looking to nature for beauty and put forward why does beauty matter in our lives? It's not really about things we collect and gather around ourselves...it's about how these things make us feel. Being attuned to our senses and surroundings ~ the colors, the textures, the atmosphere. In the book I encourage others to pay attention to the little details and create a life that is personalized and meaningful with treasures we've collected either on travels to other countries or just along the shorelines or forest floor. I devote a large chapter in the book to what I call the art of placing. 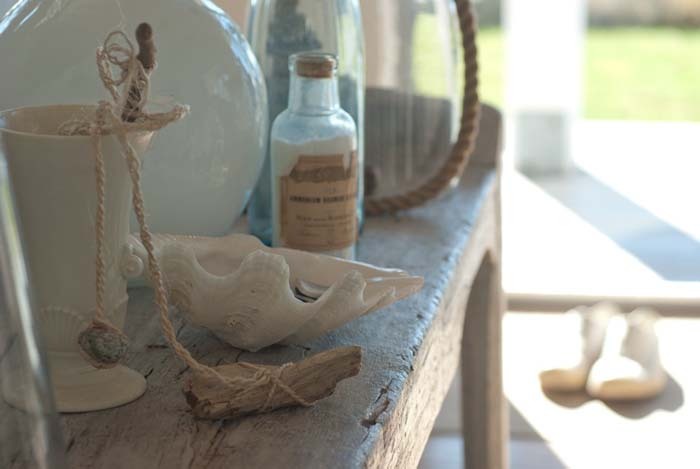 I explore the art of creating vignettes and speak about creating alchemy with objects. In the same way that a poem is created by the perfect combination of words and music is created by a combination of notes, we can create poetry with objects by meaningful placement and choices. The key is to heighten your awareness to color, texture, form, patina and create rhythm and balance, as well as tension and juxtapositions with objects so as to keep things visually interesting, unique and personal. Found objects and personal treasures can be brought together in such a way that they delight the eye and the senses and evoke a feeling when looked upon. Homes can evolve and be layered and ever changing just as we ourselves evolve personally. Things can be added or subtracted from a grouping as the seasons change. It' s really about seeing, feeling and experimenting. Exploring. Foraging. Being inventive. By mixing new old and natural finds in an artful way we can create displays and atmospheres that are truly unique and personalized as opposed to mass produced and formulaic. I have a chapter as well that speaks about styling and displays for artisans, shopkeepers and those who want to learn to style and perhaps shoot their own product or spaces. Having been self-employed for 30 years, as both a maker and a merchant, as well as professional photographer I thought I was in a unique position to share my varied experience with others. Most book authors would actually have a separate photographer and stylist create the imagery, so this really was a labor of love to create all the material! The book is lushly filled with ideas and inspirations, as well as an expansive section that explores a nature inspired color palette. Whether someone loves to arrange flowers, do food photography, interior design, styling, is a craftperson or artisan, a thrifter, a gardener... or simply just loves beautiful imagery of nature and design, I hope this book will touch them all. Having lived in Paris and traveled for years on antique buying trips, I also have a chapter on collecting with lots of info on the markets in France. So those who love treasure hunting will glean some valuable info. The enduring materials and skilled craftsmanship of antique and vintage items makes them an ideal recycled design choice. My closing chapter is called the natural forger. I encourage everyone to get out and find things in nature in a mindful, ethical way. 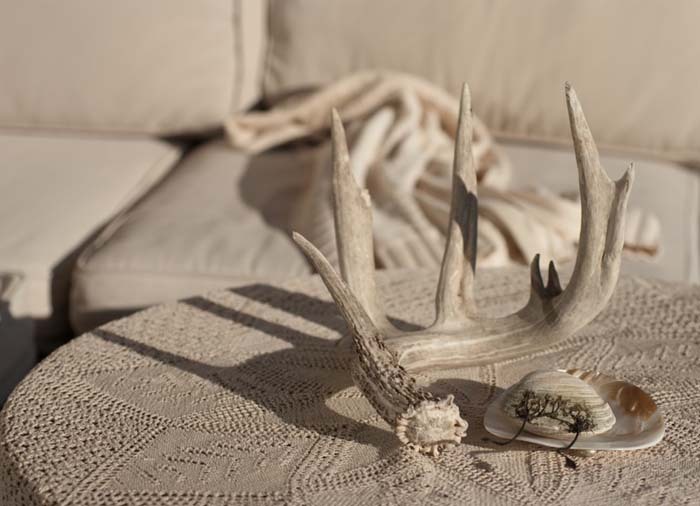 For example I only use coral that I find in vintage collections and I display naturally shed antlers. This is one of the reasons I was delighted to have Suzanne Dimma write the foreword. Of course she's a great interior designer and as editor-in-chief of House & Home she's got her finger on the pulse of both the design world and design publications. Having worked for her as a photographer for House & Home, I also knew she understood and appreciated my work as both a photographer and stylist, so having her contribution in the book was so wonderful. But her participation means the most to me because of her own ethical sourcing principals, as we both share a love of all creatures great and small. My wish is that this book heightens peoples awareness to all the humble beauty around us in the natural world, and reminds people to be mindful about practices that will help preserve our environment. Thank you Heather! We think this book is going to be a must-have reference and beautiful coffee table book all rolled into one, to inspire stylists, designers, artists, photographers, makers and the aesthetically inclined. 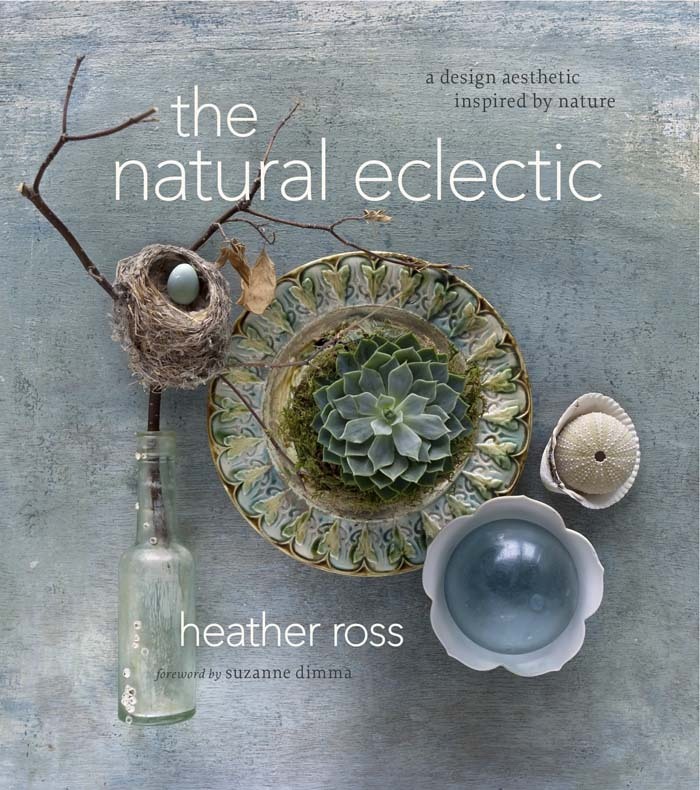 The Natural Eclectic is available to pre-order on Heather's site HERE where she has a special offer, a signed Heather Ross print of the book cover image with your book. Click HERE for more info. Visit Heather Ross at IDSwest this weekend! Also Heather Ross is one of ten hand-picked designers invited to present their curated installation that entertains the theme of a Dream Workspace that will be featured in Open Studio this weekend at IDSwest. With a 10′ x 10’ raw space as a blank canvas, Heather is excited to share "The Portable Studio' concept of an inspiring workspace for the modern creative. IDSwest is at the Vancouver Trade and Convention Centre - September 24 - 27/15. Click here for more info. Can't wait to see it! S Poulsen - couldn't agree more - can't wait for her book to come out!